Story time is extremely important at our house. I have been reading to NHL and JSL since they were infants. Now that NHL is in kindergarten, he is also reading to us. Thanks to being a teacher, I love to actively engage NHL in the story. I know that this helps to expand his comprehension of the book. When we read, we talk about the characters, make predictions and then when finished we think about what we have read. Typically, we think about whether or not there are any connections to our lives. A new feature that I am going to do from time to time is going to be called Story time at Chez Angel. I will share books with you that I read with my boys. 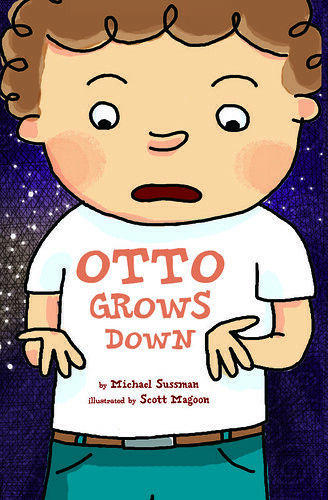 Recently, we read the book Otto Grows Down by Michael Sussman. When you open the book you are immediately brought into Otto’s world thanks to the vibrant illustrations by Scott Magoon. Not only was NHL (5) intrigued by the story, JSL (22 months) also stuck around to hear more. When you begin the story, you meet Otto, a six-year-old little boy that is celebrating his birthday. Like many other children his life has recently been turned upside down thanks to the addition of his baby sister. Even at his own birthday party, her presence spoiled everything. Otto gets so upset by her attention stealing that he makes a wish while blowing out his candles. "I wish Anna was NEVER born!" Ironically earlier in the day, NHL had made a similar declaration about his little brother. So it was nice timing. We were able to use this statement and the next events to discuss what was said. Unlike NHL’s desire, something odd happens to Otto. Suddenly the candles on his cake lit up again. Then more bizarre items take place. His watch is moves backward and Otto rewraps his presents to give back to his friends. He finally realizes that time is going backward. As you continue to read the book, you witness Otto’s life in rewind mode. While he is getting younger everything in life is opposite. There is mess-up time at school, his hair gets longer by the barber, he spits up his food, and Anna is brought back to the hospital. Otto thought that would be the end, but he continues to get younger and younger. Each year he wishes to be six again, but it does not happen. The reader watches as Otto takes a bath to make him dirty and then . . . I’ll leave the bathroom scene (a favorite of my 5 year old son) to your imagination. While Otto grows down he starts to feel bad about his sister Anna. When he turns one again, he is also worried that he would soon disappear. What happens to Otto? I am not going to ruin that for you, you have to read it for yourself. I will tell you that we thoroughly enjoyed the book. Otto Grows Down helped to teach NHL more about consequences of your words/actions. Sure, we will not grow down if we wish it, but he definitely got the point. The humor of the book and the situations that Otto encounters help to teach children a very valuable lesson about sharing the spotlight with a sibling. Go get yourself a copy of Otto Grows Down. Happy reading! This sounds like a great book! Zach is going through the Terrible Twos in a big way and Alex is having a hard time dealing with him. He still loves his brother but he gets annoyed at him a lot. This book sounds like a good one to read with him. Thanks for the review! Thank you for sharing this review. I have a niece and nephew coming that I love to buy books for but never know what to buy that they haven’t read. This will be right up their alley. That sounds like such a great book! I will definitely have to look into this one for my 2 readers. They are always reading to each other!